The yield gap between speculative- and investment-grade credits is narrowing in the offshore US dollar bond market for Chinese issuers, says S&P Global Ratings. What's driving Chinese money managers to channel cheap US-dollar funding into China's offshore bond market? There are two key drivers to this “China bid” trend: excess supply of dollar funding and the availability of high-yield bonds. Chinese depositors are hedging renminbi depreciation risk by switching some of their savings into hard currencies, especially the dollar. 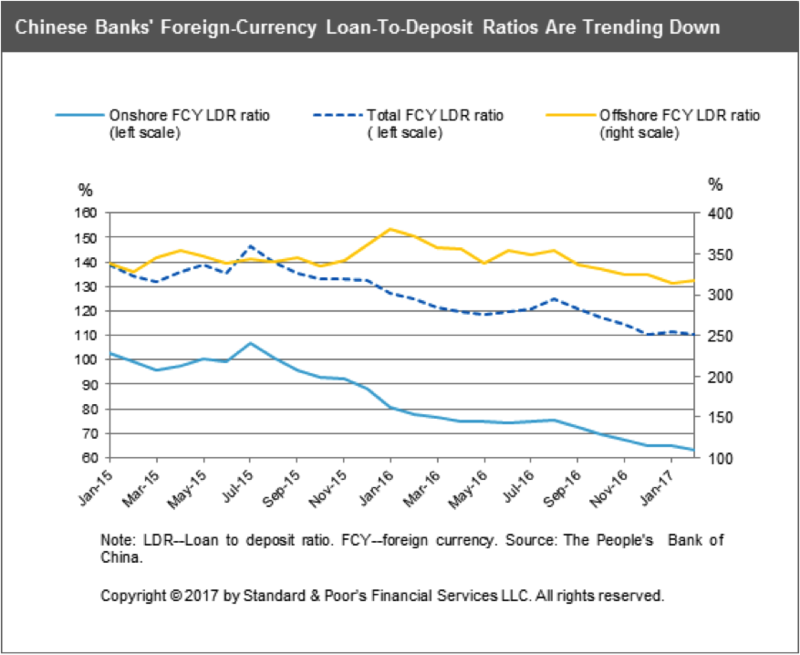 However, demand for onshore dollar loans is falling amid concerns that the renminbi is in structural decline against the greenback. The resulting onshore dollar glut is pushing down returns for Chinese banks on the dollar assets (see chart), and putting pressure on intermediaries to chase yields in the Chinese offshore bond market. We also note there could be a significant temporary surplus of dollar funds at major Chinese banks following substantial foreign-currency bond issuance to support offshore business expansions. While these funds are unlikely to be invested in less liquid speculative-grade bonds, they may have financed shorter-dated issues from higher-grade Chinese state-owned enterprises (SOEs) and Chinese non-bank financial institutions (NBFIs). Why are issuers flocking to tap offshore dollar-debt markets? Chiefly, some types of companies have trouble competing with large SOEs in the onshore funding markets. Some companies in some sectors also face tougher approval processes because their sectors are not favored by state-guided industrial or development goals. This pertains to the property developers. Private-enterprise real-estate companies are major issuers of offshore dollar bonds, which in some cases have allowed them to avoid domestic funding restrictions on real estate. Also, onshore funding costs for speculative-grade issuers have increased since the end of last year as the central bank has tightened domestic liquidity. For some issuers, the offshore market is the cheaper option for issuing debt. 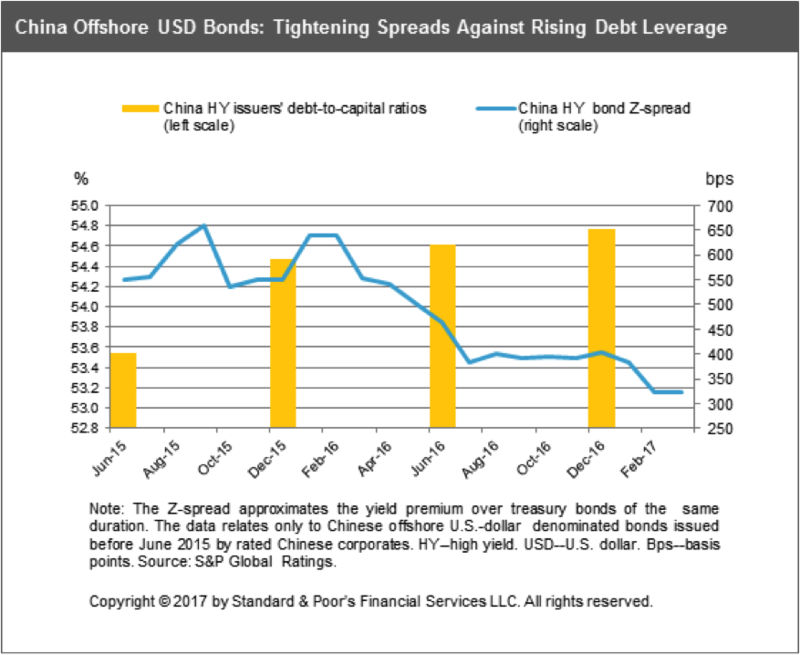 From the investors' perspective, the yields offered in the offshore dollar bond market have traditionally been higher than those available in China. Moreover, Chinese investors tend to have more faith than their global counterparts in government bailouts of distressed issuers. This optimism in part reflects the very low default rates in the Chinese bond market, both onshore and offshore. However, with onshore rates rising and liquidity tightening, favorable refinancing conditions may stall and this could lead to increase in financial stress and defaults. Who is doing this trade? Chinese NBFIs, including distressed asset management companies (DAMCs), mutual fund managers, and the larger Chinese brokers, are among the most active bidders in the Chinese offshore bond market. Chinese banks are also participating in this trade, with offshore dollar assets underlying some of their wealth management products. In short, the Chinese offshore U.S. dollar bond market is no longer dominated by international investors. One sign of the shift can be seen in the shrinking percentage of issuers that are obtaining registration exemptions from U.S. securities regulators required to sell the bonds to U.S. qualified investors. The four major DAMCs were initially incorporated with state funds in 1999 to bail out China's major state-owned banks. They have transformed themselves into profit-seeking financial conglomerates. With solid credit ratings benefiting from government support, and a track record in dealing with distressed assets, the DAMCs are known to have a higher risk appetite than major Chinese banks. The DAMCs have been actively issuing U.S.-dollar denominated notes and bonds in the offshore market and, we believe, investing a significant chunk of the proceeds into high-yield bonds. Likewise, a few major Chinese brokers have also taken advantage of their relatively stronger credit standing to execute offshore carry trades. How long can this market phenomenon last? The China bid will last as long as there is access to cheap U.S. dollar funding that can be channeled into profitable offshore trades. Based on current dollar liquidity conditions in the onshore market, we don't expect the China bid to wane anytime soon. What are the credit rating implications for Chinese financial institutions? At this stage, we see a limited direct impact on Chinese banks, which generally are not active investors in the high-yield market. The banks may have indirect exposure through their holdings of Chinese NBFI bonds or through their wealth management businesses; however, these exposures are small relative to their capital bases. Which corporate sectors are getting bid up in this phenomenon? Sectors including consumer, retail, and commodities are benefitting from falling offshore credit rates. However property developers have long dominated the offshore U.S.-dollar bond market. They are the biggest speculative-grade issuers, and have established track records in the market. Default risks in real estate have been low despite a sector-wide weakening in debt-servicing capacity over the past few years. Moreover, real estate has not been as plagued by accounting, management, and governance issued compared with other sectors that have tapped global capital markets. What could go wrong with China bid? Lots of things. We believe this is a liquidity-driven trend that is divorced from credit fundamentals. Spreads have tightened as credit fundamentals have remained weak or worsened (see chart). As such, the trend could reverse course if conditions change, i.e., if the renminbi sharply depreciated, leading to rising repayment risks. Also, if the government decided to strictly control access to the offshore bond market, and issuers found themselves unable to tap domestic capital markets, then refinancing risks could surge. In both situations, the institutions conducting carry-trades would suffer losses due to falling bond prices and rising credit losses. In the meantime, falling offshore funding costs have led to a surge in U.S. bond issuance by Chinese companies, leading to buildup in currency risks and higher financial leverage. Corporates have traded lower funding cost and liquidity for higher risks in terms of greater exposure to foreign currency borrowings. Since mid-2016, the proportion of foreign currency borrowings in the capital structure has risen materially. Many Chinese companies tapping the U.S. dollar bond market have little or no foreign-currency revenues. This includes property developers and local government financing vehicles (LGFV). Moreover, the hedging of currency risk is not a common practice for many companies because of prohibitive costs. If the renminbi sharply fell, the repayment burden would rise. The rising foreign-currency credit exposures, combined with the risks of the renminbi depreciation, could invite policy intervention that could unwind Chinese investors' funding of speculative-grade issuance. While these are the usual risks of cross-currency carry trades, in our view, Chinese regulators would avoid policy adjustments that led to a surge in financial stress or default rates. But policymakers will need to monitor the situation. Abundant liquidity creates complacency such that underwriting standards deteriorate, bond structures and covenants weaken, and information risks rise. The broader trend reflects the increase in unrated bonds being sold as the China bid over-emphasizes returns and neglects the risks.